I went out on Sunday, because I figured if I'm not going to catch any fish at least I can have coffee with the guys. Turned out to be true. 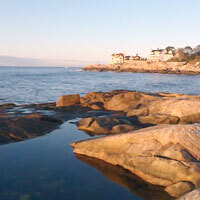 Back to the rocks in Gloucester and no sign of fish. A favorite cove near the end of Atlantic Road where I used to catch Striped Bass. The forecast was for really great conditions, so I got out an hour earlier than usual. I started on the rocks on Gloucester's backshore and fished for an hour in the dark with several different needlefish - nothing at all. I fished another hour at first light with a variety of top-water plugs - absolutely nothing. I tried a couple more spots and even came back after coffee - not even a hit. 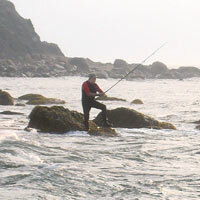 Unidentified fisherman near the Elks Lodge in Gloucester. Well, at least I didn't get skunked again. Fished a spot I like on the back shore and I got a good hit at about 6:15 on my white pencil. At about 6:30 I hooked up with a decent fish but it turned out to be about a 9 lb Bluefish. That was it for another crappy morning of fishing the north shore. Way too nice a morning for fishing. Need some clouds and drizzle. I tried the rocks in Magnolia, just south of Rafe's Chasm. Nice water and a pretty good tide. Absolutely dead. Not a sign of fish. A pretty fall morning in Magnolia. Thought I would fish the SE corner to get that northerly wind at my back. Conditions were a little difficult but fishable below SE Light, but again I had no action at all. Mid-September and I can't catch a fish on Block Island. Yikes. Instead of shooting another sunrise, I took a picture of some local beach art. 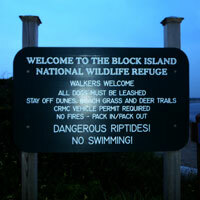 I went out to Block Island for one night to take care of a couple things at the cottage we bought there this year. 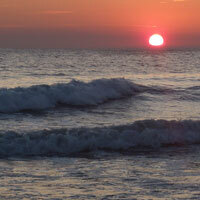 There was a great incoming tide, so I was optimistic about both night and morning fishing. The stiff NE wind was a challenge, however. I tried the left side of Charlestown for a while but it was choppy and weedy and I had no luck. I drove to Grove Pt. and tried my favorite spot near there. Not the best conditions for that spot and I had no luck. Skunked. Ten years ago, this morning, I was on a flight from Boston to London. When I got to passport control at Heathrow, the guy asked me how long I was staying in London and I said only a couple days. He told me that while my plane was in the air, two commercial jets had hit the WTC towers and I might have to stay a little longer than planned. I really thought he was pulling my leg. Still pretty dead on the Gloucester back shore. I managed a 26" striper and that might have been the best fish of the weekend! Maybe it's time to try another spot. 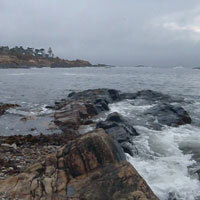 Big surf, wind and rain this morning on the Gloucester shore. Fished a couple different spots on the backshore rocks. Didn't see anyone else out there. Lots of casts, but no sign of fish. Because of the rainy/windy forecast, I went out a little late. 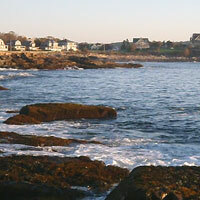 I tried several favorite spots on Gloucester's backshore and never had a fish or even a hit or splash. Back again to Gloucester hoping to find those nice bass. Many more fisherman out there on this Friday morning before Labor Day weekend. No action at all on this morning. Didn't see anyone with a fish on. Finally got back out there after a six week hiatus and I actually caught a couple nice fish. 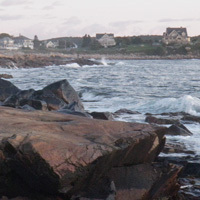 I fished the rocky backshore in Gloucester. 45 minutes of casting at one favorite spot produced nothing. 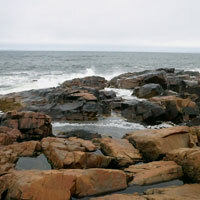 I walked a couple hundred meters north to another good spot and scrambled down the rocks. First cast with yellow/red Gibbs pencil and what looked like a small fish missed my plug. But it tried again and I was hooked up with what I thought was a small bass until it took off for a very long run. Took a while to turn her around and a couple more runs before I had the fat 41" on the rocks. Two more casts and I caught a 35 incher and that was it. 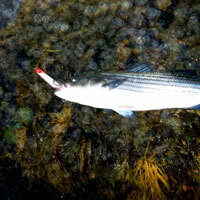 Should have moved sooner but felt lucky to get one really nice striper. 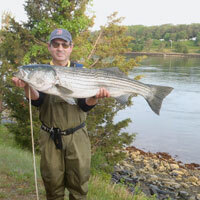 This north shore striper was 27 lbs. I fished Black Rock and had my favorite area to myself. I got a couple 25" stripers on a white needlefish just at first light and then nothing for a long time. I wanted to bring back one more fish and I had also promised a couple fillets to Lina, the breakfast waitress at Ernies. 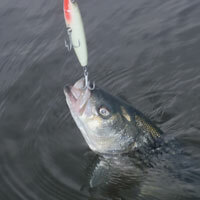 Just about when I was ready to quit, I got a good strike on the white 2oz Gibbs pencil and I landed a fat 32" bass. Perfect. Amazing how when the fishing is slow, you can be so happy about a 12 lb fish. I kept three fish on this trip and this was the last. I was very surprised that a relatively small rain from two nights ago still had the waters below SE Light cloudy with clay. But I was too lazy to walk back up the stairs and try another spot. 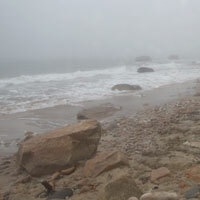 I walked the shore and made casts from several spots but, as always in these conditions, it was completely dead. 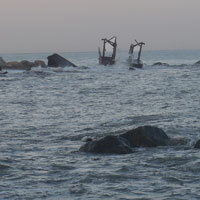 I walked a long way along the SE corner looking for clear water until I came to this old shipwreck. I got to my favorite spot at a little after 3:00 am to fish eels on the incoming tide for the last couple hours of darkness. 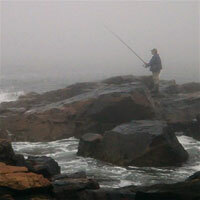 I'd made a few casts and caught one 25" striper when lightning and thunder chased me back to the car and back to bed. 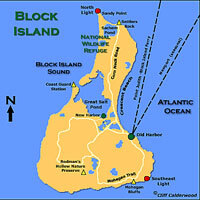 Block Island is shaped like a pork chop. 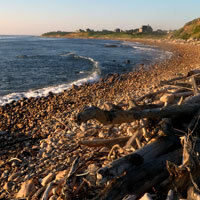 I went down to Black Rock Pt., which used to be one of my frequent haunts, for the first time this trip. It was beautiful down there and I fished sunset on the first half of the drop. I got a couple small bass while the sun was still showing and then nothing for many casts. Then, a big hit on my white Gibbs and a good fish on. About half way in, I dropped it. decent fish too. Next cast, same spot, big hit and miss and then hook up on 2nd try. Bigger fish. Had it 15 feet in front of me and hung up on a rock. plug comes back with weed but no fish. Nothing after that. not a splash. 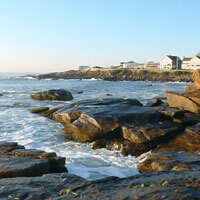 The beautiful, rough southern coast of BI. Started at my spot near Grove Pt. and still not great. I got 3 stripers from 26 to 31". Walked to Sandy Point and it was dead there. 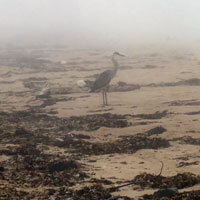 It was just me and this bird on a very misty morning at Sandy Point. Fished sunset at SW Pt. on dropping tide. Had four decent hits but never hooked up. This summer I'm having no luck at SW Point. Too many pictures of SW Point sunsets, so here's the nasty 1/4 mile walk out the the Point. 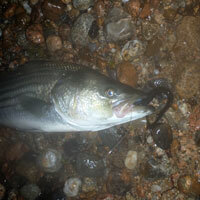 I fished my night spot near Grove Pt. 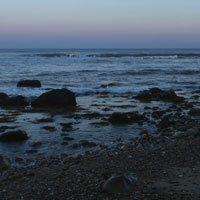 while it was dark at the start of the drop and then, at false dawn, I walked out to Sandy Pt. I only got one 31" bass in the dark on a needle. At Sandy Pt., I had no luck in the rip, but stripers started showing on the west-facing beach at about 5:00 and I got five, from 24 to 30", on a small popper. 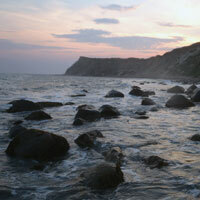 First light on the northernmost tip of Block Island. I was looking forward to going back to my spot below the SE Lighthouse to get some of those aggressive top-water hook-ups at sunset. I didn't think it had rained much the night before, but the water was grey/brown from the clay that runs down the cliffs. usually takes a couple days to clear. I should have left, but I stubbornly pretended everything was fine and, of course, never got a hit. If you can get your plug out to those rollers that are about 75 yards away, you are often rewarded with big, aggressive hits. Someone I know from Ernie's, one of my breakfast spots, asked me to give a little surfcasting lesson. We made a few casts at the Coast Guard Station without any luck. Then we went next door to Charlestown Beach. Still very slow there but we did manage to catch a couple 25" stripers on the bone Yo-Zuri Hydro Pencil. 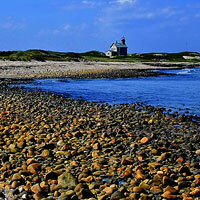 "The Channel" or "The Cut" - the Block Island Coast Guard Station. Fished under Southeast Lighthouse. Favorite top-water spot. Thick, soupy fog. Couldn't see where my white PP landed and couldn't follow it in. But there were fish there! Best was a fat 35" bass that hit right at the top of my cast. Landed three others - all keepers. Dropped one very nice one that managed to get hung up on a weedy rock after a long fight. Missed several more. Fun morning. Lousy photo of 35" striper on my rock with white Gibbs. 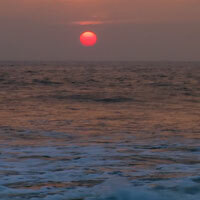 I walked to a spot on the north shore that was recommended by a top NJ surfcaster. I casted from a couple rocks while the sun set and had no luck at all. I moved to my favorite spot, also on the north shore, and I had a pretty good night with needlefish. It was slow at first, but I ended up with 10-12 stripers - almost all keepers. The best was a fat 37" bass that's my best fish so far on this trip. I started at SW Pt. hoping to get into a couple of those nice fish that I couldn't hook up the night before. Conditions were great but no fish. 1,000 casts produced one magnificent miss. At dark, I headed to the north side and fished eels for three hours on a perfect dark night. Still no big fish. I got half dozen stripers between 29 and 34". where are those 20 and 25 pounders? Even when you get skunked, the sunsets at SW Pt. are great. Gee - I'm hopelessly behind on my journal posts. Too much good weather over here! Paul left today and I went to SW Pt. 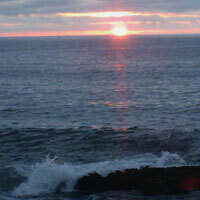 to fish a glorious sunset - really spectacular. I had the place to myself. The fishing was also pretty great but I never could land a fish. Good sized bass, maybe 32-35", were aggressively banging my 2 oz pencil popper. They just kept missing. I hooked up twice and dropped the fish about half way in. I would have liked to get one, but I still had a lot of fun. 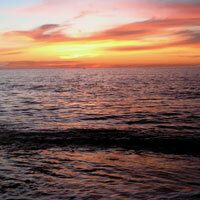 Another pretty sunset at Southwest Pt. On his last morning, Paul and I got up a little late and made it down to SE Light on a very overcast morning at 5:30 with a great incoming tide. Conditions were terrific but no fish - not a splash. Here's Paul at one of my favorite spots below SE Light. We started at Charlestown Beach and it was still dead there. We moved and made some casts at Grove Pt. and I got a couple small ones on top. We moved to my favorite night spot and fished eels. With the new moon and a SW wind, it should have been great. Paul got the first 20 lb+ fish of the trip - a 41 incher. I got 3-4 fish between 28 and 32". Certainly not great - but more encouraging. An Indian man stopped me and asked about the "dangerous reptiles" - he thought "riptides" was reptiles - Paul and I laughed for a long time. Perfect conditions for my honey hole on the north side, so that's where I went. I fished eels and it was a little slow. I got a couple small keepers and a couple schoolies. Then, at sunrise, when the fishing at this spot usually shuts down, I got a nice, fat 34" fish which will be dinner tonight (and tomorrow). Eels work great at my favorite honey hole. 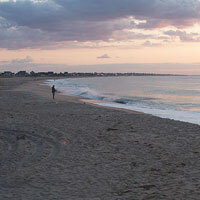 Tried Charlestown Beach at sunset again. Still dead as the sun set. Weird - usually a mix of small bass and blues. As it got dark, fish started to break on top. I couldn't get them to hit anything. 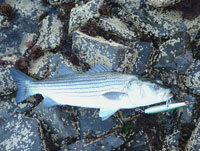 Finally, I worked a small bone popper as slowly as I could and a nice 26" striper banged it. Then, in the darkness, I got pretty good action on a white ronz soft bait. I got 3-4 stripers including two small keepers.It was a relief to catch a couple fish. 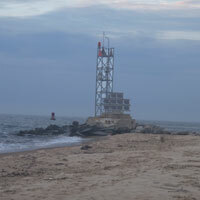 The very end of Charlestown Beach at the Coast Guard Channel. I went down the steps to try SE Light. I forgot that the very hard rain of the previous day had likely washed clay into the water at this spot. I fished it anyway and was rewarded with bupkis. Completely dead. Very foggy morning below the SE Lighthouse. 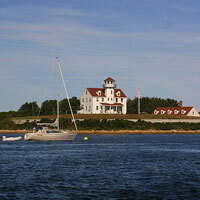 Back on Block Island - for 3 weeks! Simona and the kids went to Italy early this year and this is the first time I've been here this early in the summer. Arrived on the ferry at 5:00 and managed to fish sunset at Charlestown Beach One splash - that's it. Skunked. Last spring, when I first tried fishing the Canal, I was watching all the other guys hook up and, when I did hook a big fish, I couldn't handle it in that current. Now, I'm starting to get it figured out. I had only two hits this morning and I landed 41" and 43" Stripers. I could see maybe 25 guys fishing from my spot and I think I did the best this morning. There was a very slow pick, but if you were patient, and made lots of casts, there were some nice fish coming through. I tried a lot of the popular Canal plugs, but ended up getting both fish on the same Mackerel pattern pencil popper that I used successfully a couple weeks ago. Man, when you hook a big fish, you just can't let it run a long way in the current. You have to keep your drag very tight and fight the fish from the get-go. The bigger of the two fish tore the belly eyelet out and straightened the tail treble but remained hooked. It was a fun morning. This nice 28 lb Striper took a Mackerel pattern Gibbs Pencil. Finally made it to one of my favorite early season spots - Castle Neck River. I was the only one back there on an overcast, drizzly morning. I saw a little bit of feeding near the surface but not much. Between 5:30 and 6:00 there was decent action on long casts with a bone Yo-Zuri Hydro Pencil. I got three stripers between 21 and 25" and one about 30". I missed a few others. They were very picky and quite a few just came up and took a look. Even when they hit, they weren't totally convinced. It was nice to be back there. The tides were lousy everywhere - Castle Neck, Poponnesett, the Canal. I chose the Canal because I had fun there last Friday. 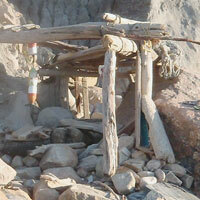 No one was there so that tells you that the conditions were less than ideal. No action at all. I should have ventured somewhere else. 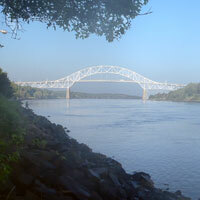 Cape Cod Canal at first light with Bourne Bridge in background. Of all the places I've fished, the Canal is the trickiest in terms of picking the right lure. Almost anywhere else, if other fisherman are catching fish, I can put on a favorite plug, say the yellow/red Gibbs pencil, and I'm catching fish too. Not at the Canal. For the first two hours this morning, I couldn't get a strike and the guy on my right is hooking up every 10 casts. He caught at least 8 fish between 15 and 25 lbs. Plenty of other guys were also hooking up. Not me. Finally, at maybe 6:30, I put on a 3 oz Gibbs pencil with mackerel pattern and I hooked up with a decent fish. From then on, I kept up with Mr. Superangler on my right. I finished with three stripers between 34 and 37" and one 40 incher. I didn't see a fish much under 15 lbs caught. There was only a little surface activity - for the most part they weren't showing and many of the best fish were caught after the sun was up. This pretty 37" Striper is probably swimming past Race Point right now. Drove down to the Canal as I like a low tide with slack current. I fished near the ice rink and there were probably a dozen guys. I only saw a few fish busting closer to the north side. I had no action while it was dark but then the guys around me started picking up a few fish at first light, but it was a slow take. I was switching between a polaris popper and a 6" storm shad. Finally, working the shad real slow with big jerks, I hooked a nice fish. The current had started west to east and the fish, of course, went that way. The guys on my right had to pick up their lines, so I really muscled the fish more than I like so they could get back to fishing. But it still took maybe five minutes because of the current. For sure, a 38", 19lb fish is my best "first striper of the season". I got a couple more that were about 30 inches. Three hook-ups - no other action. Nice early June Canal Striper. Finally got out. Lots of good reports from around Popponesset, so that's where Paul and I headed. We walked all the way down the Spit and I caught two 5-6 lb Bluefish on my first three casts. I didn't get another hit the rest of the day. After some breakfast, we fished Oregon Beach for a couple hours. Paul got a small keeper Striper and had a couple more hits and one hook-up. I had no action at all. It was nice to get out, but I wish we had done as well as Chenson or Chris did last week.